Three days after a successful launch from California, SpaceX fired off another Falcon 9 rocket Monday, this one from Cape Canaveral, boosting nearly three tons of supplies and equipment into space for a two-day flight to the International Space Station. Equipped with a previously flown first stage and a Dragon cargo capsule making its second flight to the lab complex, the Falcon 9 thundered away from pad 40 at the Cape Canaveral Air Force Station at 4:30:38 p.m. EDT (GMT-5), climbing directly into the plane of the station's orbit. SpaceX made no attempt to recover the first stage, which helped launch another station supply mission last August, opting instead to test a more extreme re-entry trajectory to collect additional data about the booster's performance and capabilities. 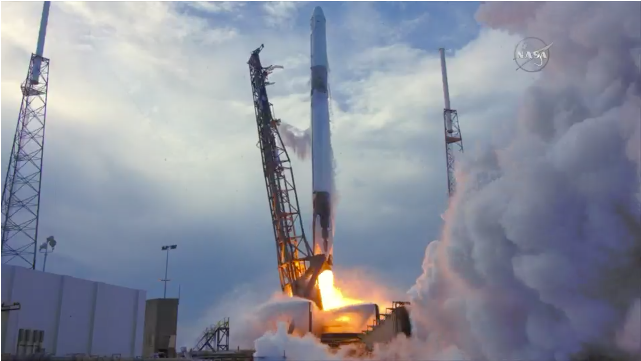 "This is the second resupply mission for NASA where we're not only flying a flight-proven booster but we're also flying a Dragon that has already been to the International Space Station," Jessica Jensen, director of Dragon mission management for SpaceX, told reporters Sunday. "What's really neat about this is this is becoming the norm, and we like that," she said. "Reusability is really important for the future of space flight, it's the only way we're going to get thousands of people to space to ... make life multi-planetary. Otherwise, it's just going to be a cost-prohibitive dream." The launching marked SpaceX's 52nd flight of a Falcon 9 -- its 53rd counting the maiden flight of the Falcon Heavy rocket in February -- its 14th station resupply mission and the company's eleventh flight using a previously flown first stage. Is Elon Musk's Tesla now just space junk? But as always, the primary goal of the mission was getting the payload into the proper orbit. The Falcon 9 chalked up another smooth climb to space and the Dragon spacecraft was released into its initial orbit about 10 minutes after liftoff. A few moments after that, its two solar arrays unfolded to begin providing power. If all goes well, the capsule will execute a carefully choreographed sequence of rendezvous rocket firings over the next two days, pulling up to within about 30 feet of the lab complex early Wednesday. At that point, the station's robot arm will lock onto a grapple fixture. The Dragon then will be pulled in for berthing at the Earth-facing port of the station's forward Harmony module. Packed in the Dragon's pressurized compartment are nearly 2,360 pounds of science material and experiment hardware, 758 pounds of crew supplies, including food and clothing, 326 pounds of vehicle hardware and 350 pounds of computer gear, spacewalk equipment and Russian hardware. Mounted in the spacecraft's lower, unpressurized "trunk" section are a materials science experiment package, a spare pump for the station's ammonia coolant system and an instrument developed by the European Space Agency to study thunderstorm lightning and hard-to-detect high-energy jets that are shot up to the edge of space. "We'd like to understand what is it," said Torsten Neubert, principal investigator for the Atmosphere-Space Interactions Monitor, or ASIM. "They have been observed for a while, from mountaintops, for example, and there have been a few satellites also. So we know a lot about the physics but we don't really know particularly well how, for example, terrestrial gamma ray flashes are generated." Processes that generate lightning in the lower atmosphere happen so fast they are difficult to study, but in the upper atmosphere development is slower and easier to detect. "What we're looking for in the upper atmosphere is actually lightning subprocesses, which are difficult to measure down on the Earth because lightning is so fast," Neubert said. Putting instruments on the space station "is like being on a balcony, viewing the whole scene." "So we have this fantastic view of this upper atmospheric laboratory where we can measure fundamental lightning processes," he said. "If we know more about lightning, we know more about what lightning does to the atmosphere. Ozone, trace gases that are important for our radiation balance, climate, we'll know much better what lightning does and what role thunderstorms play in the atmosphere dynamics and climate." Another intriguing experiment is a small satellite provided by the Surrey Space Center known as RemoveDEBRIS that will be deployed through an airlock in the Japanese Kibo module and released into space by the laboratory's Japanese robot arm. The idea is to test technologies that could one day be used to snag and de-orbit space junk. In one test, a small cubesat will be released from the RemoveDebris satellite, which then will try to target and snare it with a net that could then be used to pull it out of orbit. "The idea is that the net, as a way to capture debris, is a very flexible option because even if the debris is spinning, or has got an irregular shape, to capture it with a net is relatively low-risk compared to, for example, going with a robotic arm," said Guglielmo Aglietti, RemoveDEBRIS principal investigator, and director of the Surrey Space Center. In another test, a harpoon-like spear will be fired at a plate to test another technique that could be used to capture a wayward piece of debris. "The harpoon is maybe simpler, just shooting a harpoon," Aglietti told Spaceflight Now. "But then one might think that maybe it's a bit more risky because you have to hit your debris in a place that is suitable to be captured by the harpoon. Clearly, you have to avoid any fuel tanks." Finally, the RemoveDEBRIS spacecraft will deploy a so-called "drag brake," an inflatable structure that will increase atmospheric drag and help ensure a speedy descent. Similar brakes could be installed on future spacecraft to help them drop out of orbit at the end of their lives. "It's a proof-of-concept, so we want to learn as much as possible," Aglietti said. "Even if some experiment doesn't go exactly as planned, provided we get all the data, it's still a positive outcome. Once the whole campaign is finished, and the satellite is de-orbited, it would be great if companies offered this as a service."" As the station crew unloads the Dragon's pressurized compartment they will re-pack it with trash, no-longer-needed equipment and science samples, stored in freezers and cold bags, that will be returned to scientists on the ground. Also coming home aboard the Dragon will be Robonaut, a humanoid robot launched to the lab in 2011 to test autonomous servicing technology. The complex robot suffered a variety of problems in the wake of work to attach leg-like appendages and engineers want to get it back on the ground for detailed inspections and repairs. The current flight plan calls for the Dragon to be detached from the station on May 2 for a fiery plunge back to Earth and a splashdown in the Pacific Ocean west of Baja California. A SpaceX recovery team will haul the spacecraft back to Long Beach, Calif., where science samples will be removed and distributed to waiting researchers. On May 20, Orbital ATK plans to launch an Antares booster from the Virginia coast carrying a Cygnus cargo ship packed with another load of supplies for the space station. It is scheduled to arrive May 24 and remain attached to the station's central Unity module until mid July. SpaceX plans to launch another Dragon resupply mission June 30, with the cargo ship remaining attached until the end of July. A Russian Progress cargo ship is scheduled for launch July 9. SpaceX holds contacts valued at more than $2 billion for 20 space station resupply flights -- Monday's flight is No. 14 -- along with a second long-term resupply contract, with an unspecified value, for another half-dozen missions through 2024. In addition, SpaceX is building a piloted version of its Dragon capsule to ferry astronauts to and from the station under a separate $2.6 billion contract.